This site is dedicated to the photography of Hans Joseph Lutz 1895-1972, my grandfather. Here follows a short biography. Joseph P Lutz was born in Berlin in 1895. At 17 he started as an apprentice for a local portrait photographer, Zoltan Gahl, a rumanian refugee. He stayed with Zoltan for 10 years. During these years he met a lot of Zoltans artistic friends, among them a young Otto Dix, whose art turned Jospehs world upside down. In 1928 he started his first studio and began to work as a portrait photographer. He had by then got really interested in lighting, this after being exposed to some of the works by Baron de Meyer, who’s strong backlighting and soft focus had a strong impact in him. Also Steichens elegance was a big influence. It was during this time he got introduced to the artists in the Cabare Pyramide and made all their promotional and publicity photos. One of the artists was Gertrude Schönbacher who became his wife in 1932. Next year Gertrude gave birth to a son, Hans ( my father ). He was , for unknown reasons adopted by the Bauer family, who is the only family I have known, until the identity of Joseph was revealed to me, a year ago. Since then I have searched for information and images of him and of his work. Most information I got from Alice Brown, daughter of matte painter Charles Brown who worked with Joseph ). In 1936 Joseph and Gertrude moved to England for a brief period. During their rather short stay in London they realized that returning to Germany was not an option anymore, due to the political climate. Instead they decided to travel to America as many of their fellow Germans did in the early 30s. 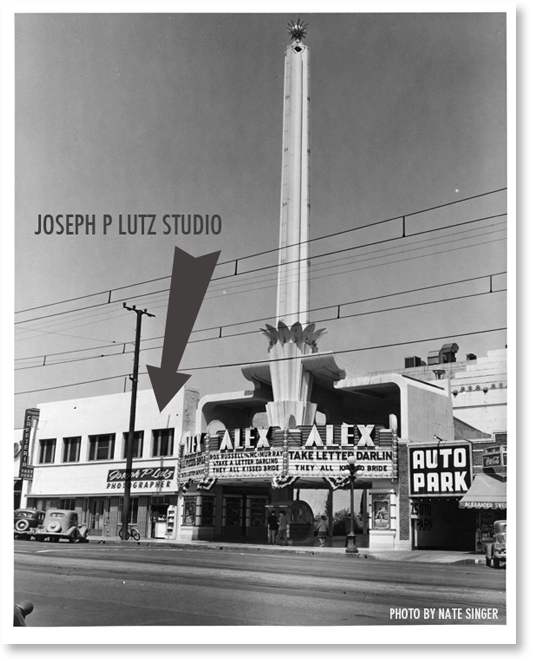 First they lived in Los Angeles but soon moved to Glendale where they got hold of a studio. They remained at the same place for 23 years ( exept for some time spent in Cannes, France, at the film festival in 1957 as he was hired by Paramount to shoot some portraits of their moviestars, among them Julia Weston, who starred in the musical Hello Paris. He had already done some promotional shots for them with Julia. He also met with the Manini Fashion team, and that pleased him very much as he had not seen the founder of it, for 5 years, Walter Oratzio Manini ). In Glendale Joseph made quite a good living taking portraits of all aspiring young actors in need of a portfolio to pursuit their acting carrers. He collaborated with Charles Brown , a very talented matte painter at Paramount, who made some backdrops for Joseph to simulate environments otherwise hard to shoot. He had also developed his trademark “border lighting”, meaning the darker lines where lights dont really overlap. For some clients Joseph had a method to make his images look more like paintings. Besides retouching the actual negative he would use some of the famous technicues that Alfred Stieglitz invented in the beginning of this century. I the early 60s he seems to have retired, and I dont have that much information on the years after this. This site will hopefully continue to grow as I find out more about my “new” grandfather. The images that are on display now seems to range from the 30s to about 1962. I got them from Alice Brown. She has now found several more , but they are in pretty bad shape and need to retouched and cleaned up.